Is your business dependent on appointments with clientele? Do you need to manage a group of vendors who visit your business regularly for deliveries? 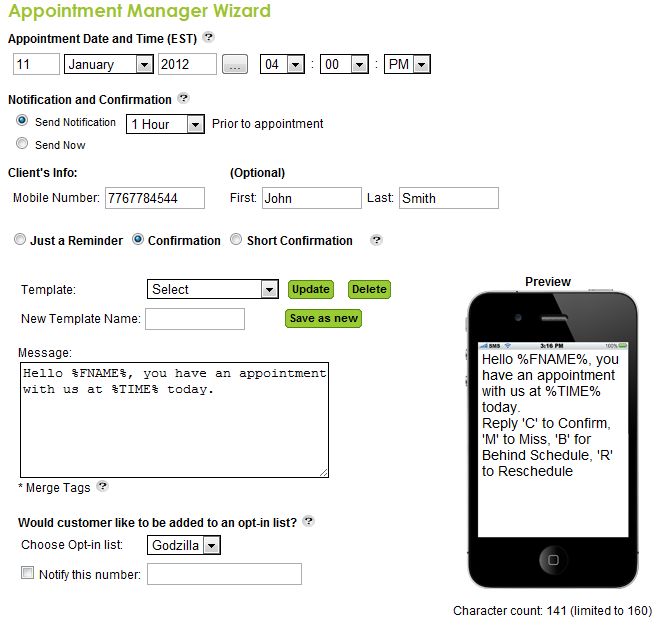 Use our mobile appointment management tools to ensure fewer no-shows! Fill downtime and schedule deliveries efficiently. Empower your business with Appointment Reminders. Our Multiple Appointment Wizard allows you to manually add up to 48 appointment confirmation messages at one time, edit them accordingly, and send them out. It also allows you to set the default date, message template, type of confirmation/reminder, time prior to the appointment that the SMS is sent, opt-in list, and the phone number that is notified of their confirmation status. Confirmation, Short Confirmation, or Just a Reminder? Choose what type of message the client receives. A reminder will simply tell them the time of the appointment. A short confirmation will allow them to reply ‘C’ to confirm or ‘M’ to miss the appointment. 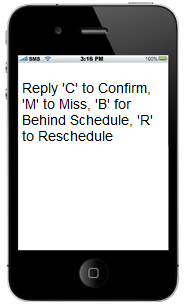 A regular confirmation message will allow the user to reply ‘C’ to confirm, ‘M’ to miss, in addition to ‘B’ for running behind schedule, or ‘R’ to reschedule. Customize the message clients receive based on their response to confirm, miss, etc. For instance, if the client responds to a confirmation message with ‘R’ to reschedule, you can send them an autoresponse to call the office with preferred times at their earliest convenience. With our .csv template, you may upload up to 100 appointments at a time on a spreadsheet application such as Microsoft Excel. It makes for a swift and organized transfer of your clients’ information from your system to ours! Once the client sends a response to the confirmation message, they will be opted in to the list of your choice. If you have uploaded their information into the appointment management system, the information is automatically saved in the list upon their response!